I believe that I have discovered a continuation to that story. 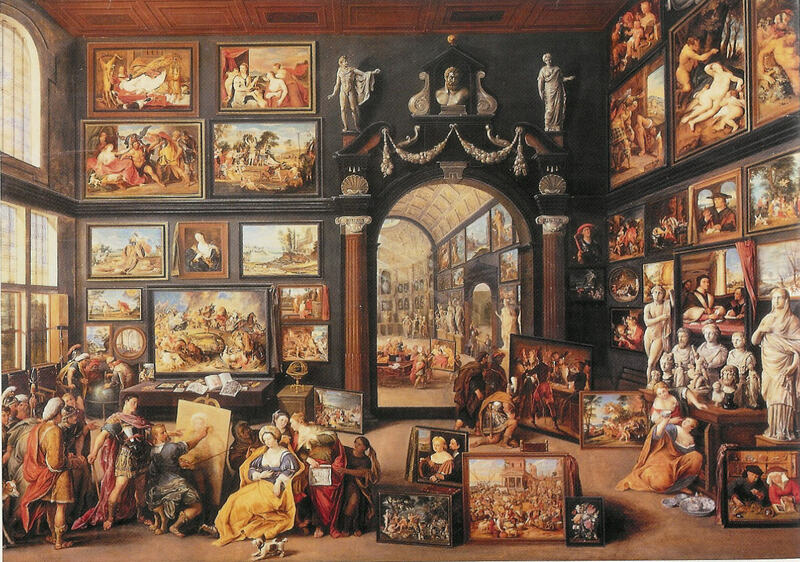 The evidence lies in a painting that is depicted both in van Haecht’s Kunstkamer of Cornelis van der Geest (as well as in three other kunstkamers by his hand) and in an allegory of the Sense of sight that is laid out like a kunstkamer and furnished with objects belonging to Albert and Isabella. 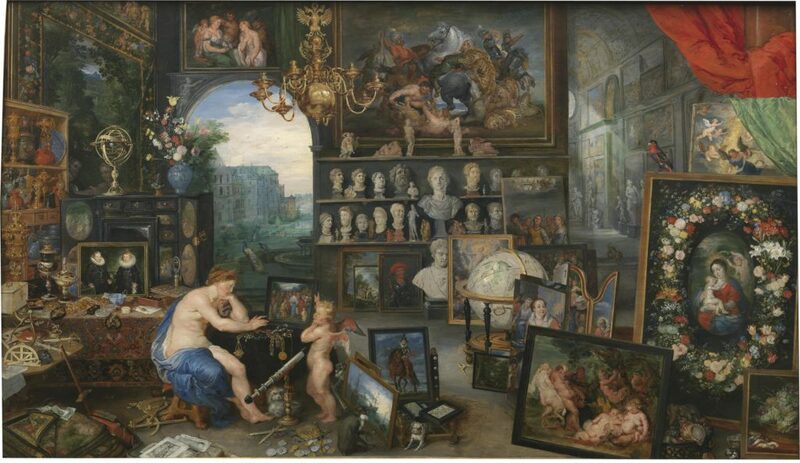 That work was created in 1617 by Jan Brueghel (1568-1625) and Peter Paul Rubens (1577-1640). 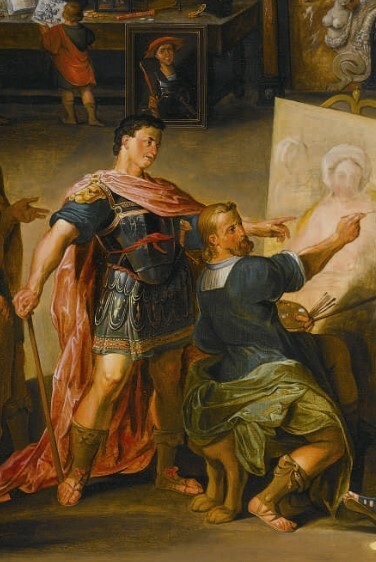 The overlap has been noticed before, but it has not been realized that this is a unique case, the only painting to occur in both contexts, and that it has special significance. 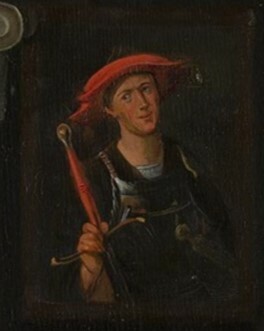 It is a half-length figure of a warrior in a strapped breastplate, holding a longsword in his right hand and wearing a large red cap. 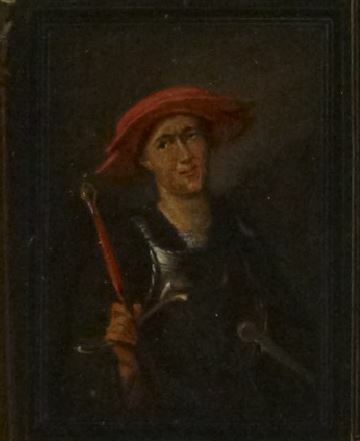 The painting has a Venetian look and has been attributed to the little-known master Domenico Mancini, though without solid grounds. 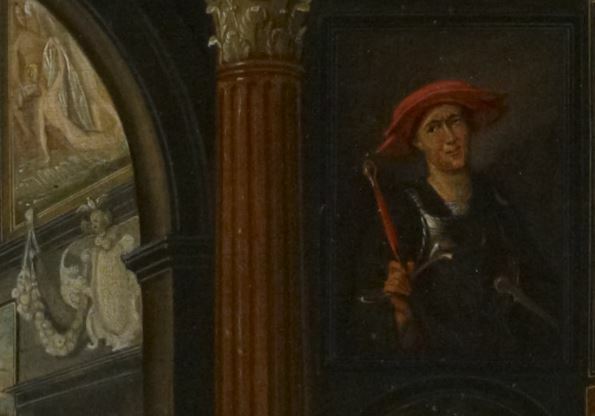 You see it best to the right of the archway in van Haecht’s Apelles painting Campaspe in the Mauritshuis (left) and Kunstkamer with van Dyck’s Mystic Marriage of St. Catherine in the Bute Collection (right). 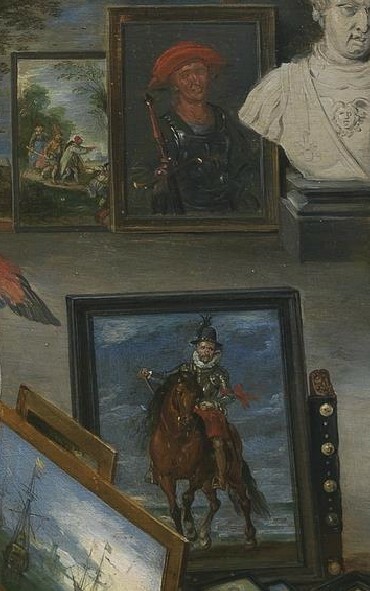 In the Kunstkamer of Cornelis van der Geest it hangs high on the outside wall (left). 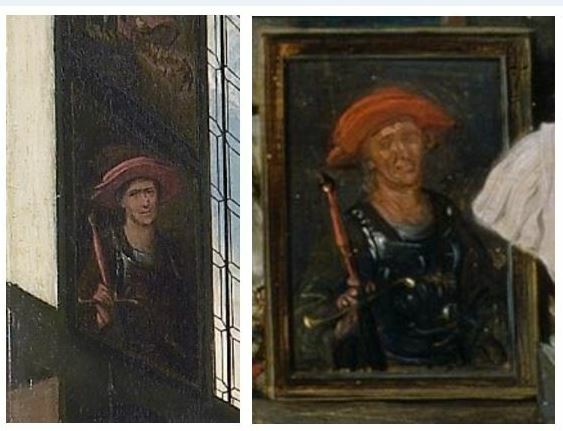 And in the Brueghel/Rubens Sense of sight on the floor in the center (right). 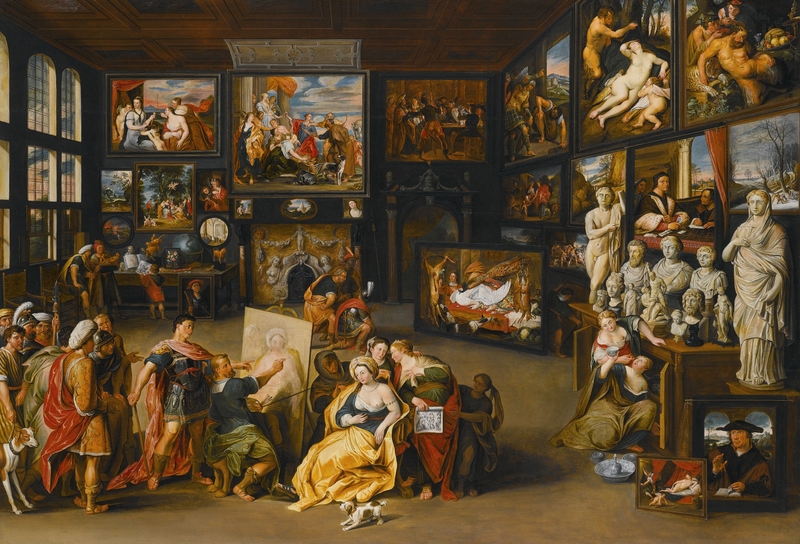 In van Haecht’s Kunstkamer with van Dyck’s Mystic Marriage of St. Catherine the painting of the soldier is juxtaposed to a sculptural motif standing for the motto of Cornelis van der Geest: the dove of the Holy Spirit (in Dutch de heilige Geest). © Gary Schwartz 2016. Published on the Schwartzlist on 31 July 2016. Revised on 8 August 2016 to include the details from the Kunstkamer with van Dyck’s Mystic Marriage of St. Catherine. 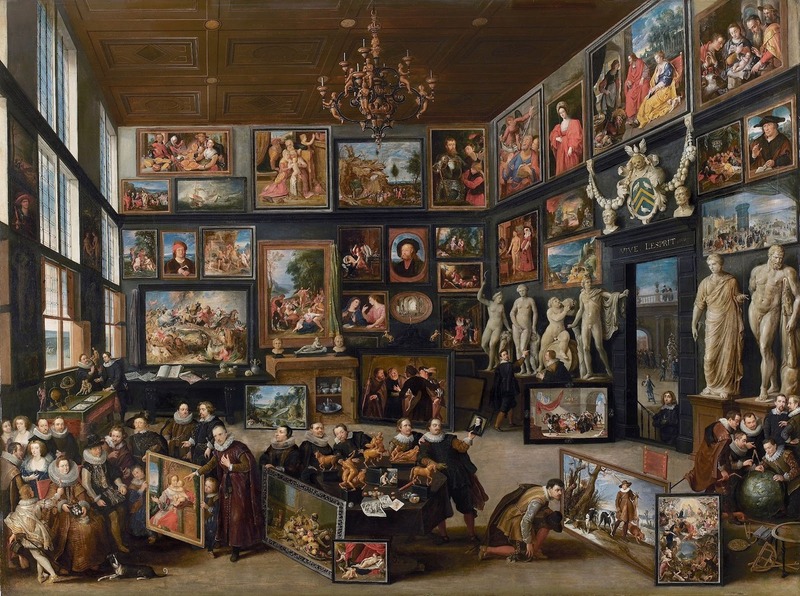 With thanks to Elizabeth Honig, creator of the marvelous Jan Brueghel wiki.